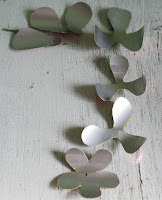 I got the idea for these, from paper flowers I used to make, from a book called "Bloemen van papier" by Hans van Eck. I though he came up with the most beautiful paper roses. Only problem was, when I tried to adapt the pattern exactly, I couldn't get the aluminum to bend properly. And I didn't want to use epoxy to attach everything, but soldering failed miserably (aluminum is really hard to solder, according to the web... I should have listened). I tried wiring things together, needless to say, non of it worked... Until , I got a little smarter, and modified the pattern. (you can find a pdf of my pattern at the bottom of the page). 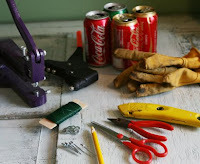 What you'll need: aluminum cans, gloves (these suckers can get sharp), box cutter, needle noes pliers, and wire cutters, regular scissors, china marker, short aluminum rivets 1/8 inch or 3mm, #6 washers, wire, hole puncher that can punch a 1/8 in hole, rivet gun... oh and a hammer came in handy. 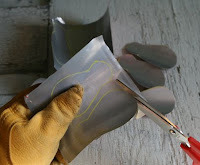 First I cut out my pattern pieces in sand paper. this is not necessary, but certainly keeps them around longer, and makes them easier to trace around. (A trick I learned from my mom). 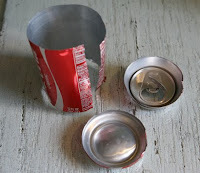 Next I took on the aluminum cans. Cleaning them out ahead of time keeps things from getting sticky. Use gloves!! You will need 2 to 3 cans per flower. 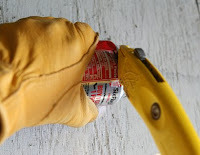 Take the box cutter and make a slit in the top of the can right below where it starts to bend. I make a slit in the bottom before the bend as well. Then simply cut off the top & bottom with a pair of scissors. 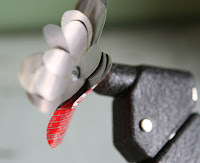 (Not your sewing scissors! 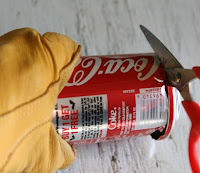 ), I find it easier, after I cut the top, to cut the length of the can to the bottom side, and then cut the bottom off. Now cut out all of your pieces. 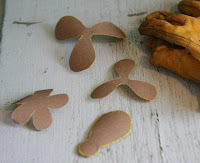 You'll need: 1 "flower shape", 2 small "windmills", 1 large "windmill", and 3 large "petals". 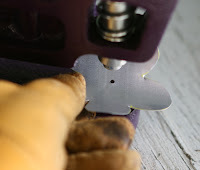 Using a hole puncher, punch 1/8 holes in each one, because we're using 1/8 rivets... for the large "petals", punch the hole in center of the small circular part at the bottom of the petal. For the others, punch your hole in the center. Take a piece of wire, and create a small loop. 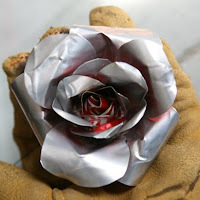 The wire will allow you to attach your rose to things, or make a bouquet. You don't want wire that is particularly thick, as that will make the whole thing harder to rivet. 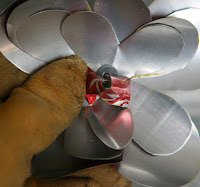 You are going to assemble your parts on to a rivet as shown (the flower structure blow up is below). Rivet, 1 washer, loop of wire over rivet, flower pieces, and then the final washer. Should look like this in your hands, with the top of the rivet poking through the center. Put in rivet gun, squeeze trigger, until the back shaft of the rivet comes off, and the front squishes (technical term ;-) ) . 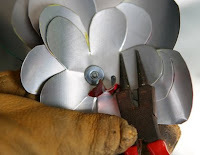 Before I start shaping my flower, I find it is sometimes useful to hammer on the top of the rivet, to flatten it a bit, and keep the top washer firmly on. It has been known to pop off sometimes, but the washer is integral, and without it the really flexible, tear able aluminum comes off the rivet when you start to work with it. OK, start building your flower... I have all of the shiny sides of the petals facing up, so this will be a silver flower, (easier to photograph). 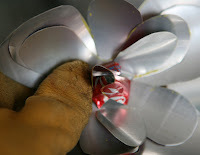 If you want to see more of the color of your can, flip the flower pieces over when loading them on to the rivet. 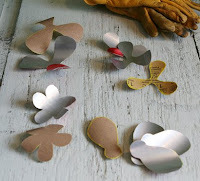 Using round nose pliers, start sculpting the little flowers petals to pop out towards you. Making a bit of a cone. I find this to be the hardest part, getting these first 5 petals done. Once you've done your first petal, start sculpting the next from the opposite(ish) side. And on the the 3rd petal, still creating a bit of a cone. Squishing the aluminum down at the base helps sometimes too. All 5 first petals done. The next layers are a bit easier to sculpt, and you can bend back the tops of the petals a bit to make them show. 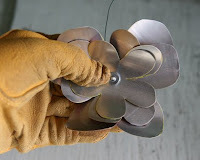 For the large "windmills" and petals, I like to start using a pencil, or whatever's handy to bend the petals back even more. 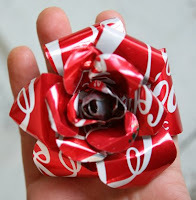 You can get creative and use other cans for leaves :-) Have fun! !